1762 Bonne Map of the Mediterranean and the Maghreb or Barbary Coast, Africa. WE SELL ONLY ORIGINAL ANTIQUE MAPS - NOT REPRODUCTIONS. Title: Carte des Cotes de Barbarie ou les Royaumes de Maroc, de Fez, d'Alger, de Tunis, et de Tripoli avec les Pays Circonvoisins. Description: This is a 1762 Rigobert Bonne map of the Maghreb or Barbary Coast. 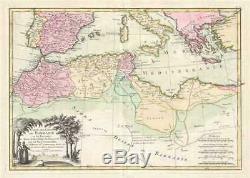 The map depicts northwestern Africa and the western Mediterranean from Portugal and Morocco to western Turkey and from Italy and the Balkans to the Sahara. The modern day North African nations of Morocco, Algeria, Tunisia, and Libya are the focus. The map offers excellent detail throughout labeling mountains, rivers, national boundaries, cities, regions, and tribes. As Bonne was preparing this map, the Barbary Coast was a hotbed of piracy - much like the Somali coast today. The Barbary Pirates would attack trading ships passing through the narrow Gibraltar straits and western Mediterranean. Ships would be destroyed or appropriated, cargo seized, and the crews and passengers enslaved. By the early 19th century, piracy in this region had become so intense that the United States launched its first major naval offensive against Tripoli. The resultant 1805 Battle of Derne later inspired a portion of the lyrics of the Marines' Hymn,'the shores of Tripoli'. A large decorative cartouche appears in the lower left quadrant of the map. This map was drawn by Rigobert Bonne and included in Jean Lattre's 1762 issue of the Atlas Moderne. Size: Printed area measures 12.5 inches high by 18 inches wide. Minor wear along original centerfold. If your address is a P. DHL International EXPRESS (45 USD). We can use your Federal Express Account. Duty varies by country and we cannot predict the amount you will be charged. Some countries are duty free, others are not. Other Services Conservation Framing: Geographicus recommends basic conservation framing services for any antique paper. We do not offer this service. Antique Map Restoration: Geographicus can repair and restore your antique map. Services include deacidification cleaning flattening and backing. The item "1762 Bonne Map of the Mediterranean and the Maghreb or Barbary Coast, Africa" is in sale since Friday, November 23, 2018. This item is in the category "Antiques\Maps, Atlases & Globes\Africa Maps". The seller is "geographicusmaps" and is located in 11221. This item can be shipped worldwide.